* No significant change in units status. Some report of grey smoke on unit 3; mixed reports but believes to be steam. * Industry has two representatives en route to Japan to represent consortium interests. Jim Ellis anxious to get started with Japanese industry, but consortium is seeking a le federal agency to be a lead coordination in recovery effort. 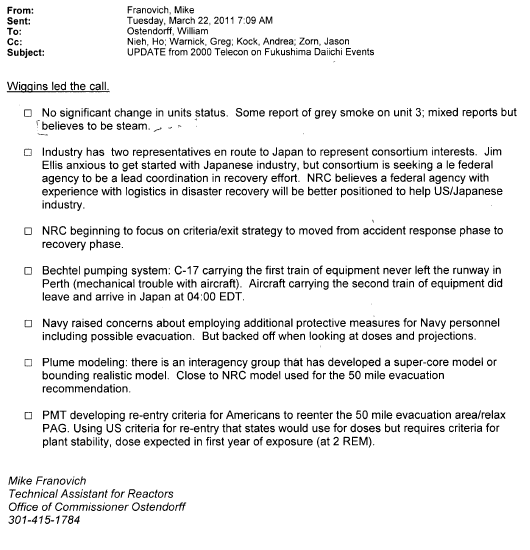 NRC believes a federal agency with experience with logistics in disaster recovery will be better positioned to help US/Japanese industry. * NRC beginning to focus on criteria/exit strategy to moved from accident response phase to recovery phase. * Bechtel pumping system: C-17 carrying the first train of equipment never left the runway in Perth (mechanical trouble with aircraft). Aircraft carrying the second train of equipment did leave and arrive in Japan at 04:00 EDT. * Navy raised concerns about employing additional protective measures for Navy personnel including possible evacuation. But backed off when looking at doses and projections. * Plume modeling: there is an interagency group that has developed a super-core model or bounding realistic model. Close to NRC model used for the 50 mile evacuation recommendation. * PMT developing re-entry criteria for Americans to reenter the 50 mile evacuation area/relax PAG. Using US criteria for re-entry that states would use for doses but requires criteria for plant stability, dose expected in first year of exposure (at 2 REM).